Truth be told, one of the few things that my husband and I have in common is our love for food. We enjoy cooking and eating together since our dating years. We've shared the best and worst meals of our lives...but there's nothing about food that we have ever argued about. Back when we were in the Philippines (when we didn't have the girls yet and didn't care that much about frugality), Ryan and I used to enjoy eating out a lot! We really loved trying different cuisines...but I don't remember being able to try Indian Cuisine back then. Actually, I don't even know if there was as Indian restaurant in Manila that time. It was only here in Texas that we got our first experience with Indian food...and it was like we fell in love with it at first taste! Ryan and I both love spicy food...and with all the different herbs and spices used in Indian Cuisine, we find it perfect for our taste buds. For our PiTCC's Favorite Dishes from Around The World series, I want to share with you one of the Indian dishes that have become my favorite. It's called Chicken Biryani. Biryani is a dish that's popular in India and Pakistan and is made of rice, herbs, and spices as well as vegetables or meat like beef, chicken, lamb, goat, fish and shrimp. The chicken version is my favorite. I just love the aroma and texture of this dish! It's an all-in-one meal that's so tasty and comforting! Thank you Tina for making me a part of this series and it was my pleasure to prepare the Chicken Biryani for you. Hope you will enjoy it! 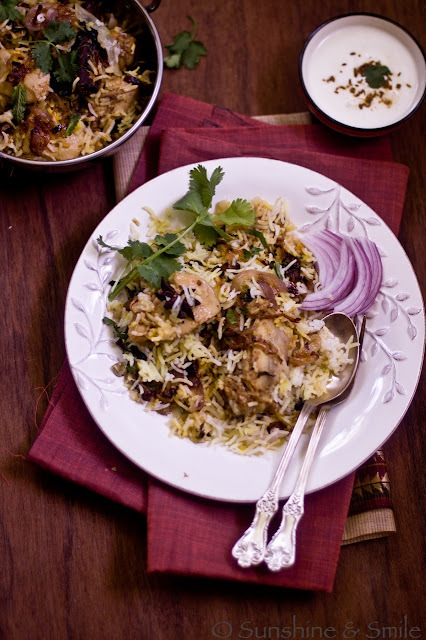 Today, I am sharing a Chicken Biryani recipe that I learned to cook from my brother when I visited home last winter. As a kid, I remember my brother would spend more time in the kitchen than I would but this time, my little brother totally impressed me with his cooking skills. One afternoon, he prepared Chicken Biryani and that was the first time that I actually enjoyed biryani. The strong aroma and warm flavors made me crave for it more than ever! Biryani is a very popular dish in India made with rice, meat and lots of spices! There are typically two types of biryani - Kacchi/Kutchi(raw) Biryani and Pakki(cooked) Biryani. 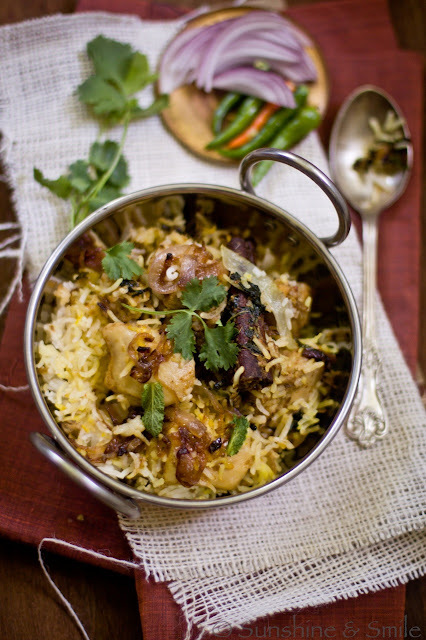 For Kacchi biryani, uncooked marinated meat and rice are layered and cooked together. For Pakki biryani, both rice and meat are partially cooked. Then, they are layered to cook for some more time and the flavors blend between the rice and meat. I prepared Pakki biryani and it's very much like Hyderabadi biryani. It involves a lot of steps but at the end, it will all be worth the effort! 1. In a big bowl, mix chicken with all the ingredients mentioned under ingredients for chicken. Let it marinade for at-least 4 hours (preferably overnight). 2. Heat some oil in a pan and cook sliced onion until they are brown in color. Drain them in a tissue and leave it aside for later use. 3. Mix milk and saffron in a tiny bowl and let it rest. 4. In a deep pan, heat 1 tablespoon ghee and drop all the spices mentioned under ingredients for rice. Once they start to release the flavor, drain the soaked rice and drop it in the pan. 5. Give it a stir, add some salt and then, add water. Stir it once and bring the water to a boil. Simmer and let it cook until all the water gets absorbed. 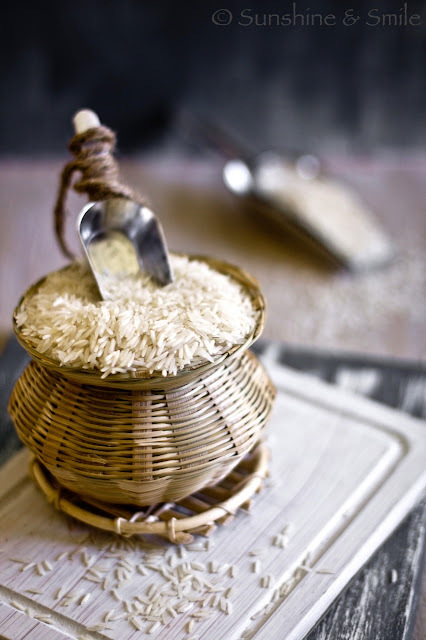 The rice should be about sixty percent cooked. Keep it aside once done. 6. In a separate pan, heat the oil and drop 1 star anise and 1 cinnamon stick. Once it starts to release the flavor, drop the marinated chicken along with all the juices left in the big bowl. 7. Let it cook until the chicken gets brown in color and oil starts to release. Check for salt and add more if required. 8. The final step is to layer the chicken and rice and cook them. It can either be done either in an oven or on a stovetop. I used the oven. 9. Take a baking dish and spread half of the cooked chicken along with some of the sauce. Drizzle 1 tablespoon ghee (clarified butter) on top. 10. Layer half of the cooked rice and pour one tablespoon of the saffron milk over it. On top of the rice, add half of the chopped mint leaves and half of the caramelized onion. 11. Repeat another layer of chicken and rice following the exact same steps. 12. Take a heavy-duty aluminum foil and cover the baking dish tightly. Use another foil on top, if required. Cook in the oven at 350 F for about 30 minutes. Serve warm with some yogurt on the side. Mmmmm...that Chicken Biryani truly looks delicious! Thanks again Kankana for sharing your recipe with us! For more mouth-watering recipes and stunning food photos, do check out Kankana’s website, Playful Cooking. You'll truly be amazed with how good she is both as a cook and a photographer...and her recipes and photos will surely bring sunshine and smile to your life! You can also connect with her via Twitter and Facebook. That looks and reads amazingly yummy! Chicken biriyani looks delicious Tina. I agree with you Kankana is good photographer and cook. The pleasure is mine, Kankana! I'm truly honored to have you here! A million thanks for the very wonderful guest post! This dish looks amazing! The spices combo sounds fantastic! Thank you for sharing! I love Indian cuisine, but don't cook it often enough. This chicken biryani looks so gorgeous and appetising, I want to spend hours in my kitchen and cook Indian all night long. I have had this dish one time at a restaurant and it was very tasty. I did not realize all the steps involved, but if you know of the delicious end result you will not even notice all the steps! Glad you featured Kankana here, she did bring along an inspiring recipe-yum! What a great post Tina,I love Indian foods,I have one favorite restaurant here "Taste of India"
@ kankana : chicken biryani sound flavorful,looks mouth watering too !! I am glad to see Kankana here,her food and photography both are absolutely delicious!!! Biryani looks fabulous, I am so craving this now. It's a funny coincidence that I made Chicken Biryani for dinner last night! :-) I am a Biryani lover though mostly when eating out I prefer to have Mutton Biryani. I always ate it outside or cooked by Mom until about 5 years ago when I finally tried my hands on it. You are so right that it takes time (and patience) to get it right. I never thought of baking it in the oven - That's a great idea! I usually put it on a tawa and cover the pot with aluminum foil, then put something very heavy on it to allow it to cook. The perfect recipe and dish because we love Indian food so much. This beriyani is simply splendid and one which we also try out when eating out. So fun to have your hubby cooking together with u. I've been invited to a cooking event tmr with my hubby & I'm really looking fwd to it. It's really a great bonding event. I'm happy for u too, dear! 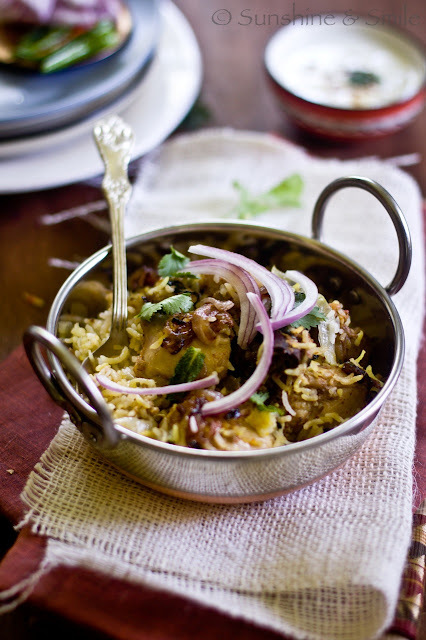 I love Indian food and this is such a great guest post, Tina. I am a fan of Kankana's cooking and her beautiful photography. Thank you ladies for sharing this wonderful recipe. 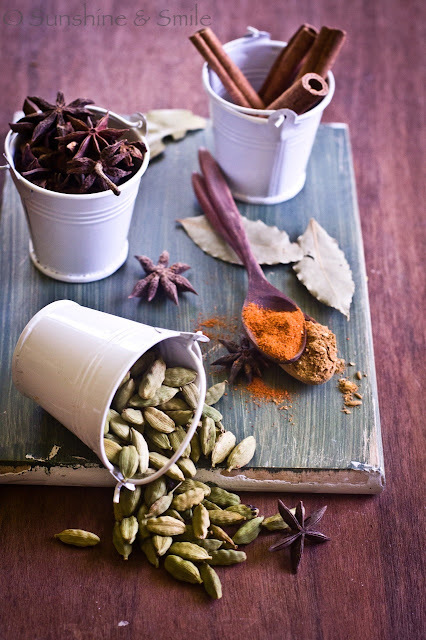 Beautiful recipe Kankana, I just love these warm spices! This is a classic recipe. I have never tried it yet but the photos just made me really hungry! Great post from Kankana! Hi Tina! I also enjoy Kankana's blog and her beautiful photography. Kankana, you are NOT "wannabe" photographer because you ARE already a great photographer! Your chicken biryani looks so delicious! wow Tina...you have made the biryani just perfect !!! !n the clicks r just too good !!!!!! !wonderful presentation !!!! !